The perfect appetizer to accompany a glass of dry red wine, or a snack to add a little “gourmet” to your afternoon. If you already have the pesto (you have tried the pistachio arugula pesto recipe I posted last week, right? ), these come together easily; then it’s just a short wait while they roast, and next thing you know, you’re sinking your teeth into a mouthwatering ball of deliciousness. Just the thing to hold you over until your next meal. The exact quantities in this recipe depend largely on the size of the mushrooms you get. Check out the photos for an idea of the relative amounts. Preheat your toaster (or conventional) oven to 350° F. Line a baking sheet with aluminum foil (optional, makes for easier cleanup). 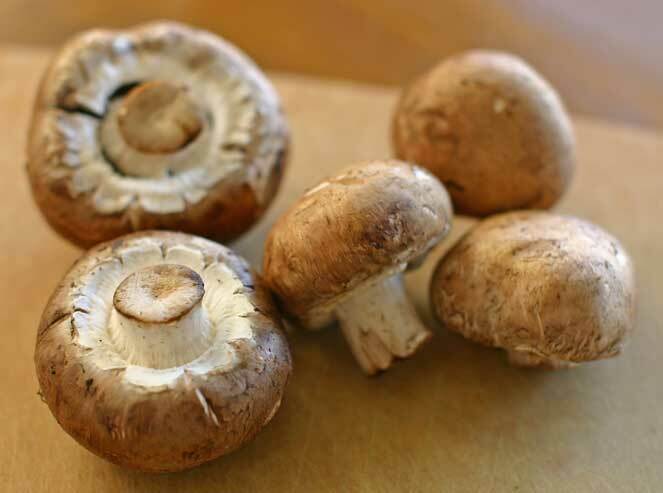 De-stem the mushrooms, scrub the outsides with a veggie brush, and scoop out the mushroom gills from the undersides with a spoon. Wipe them down with a damp paper towel. Avoid running them under water too much. If you do, they’ll absorb the water instead of the pesto. Chop two of the mushrooms into tiny pieces. In a small pan, heat the coconut or olive oil over a medium flame and then sauté the chopped mushrooms until they reduce and soften. 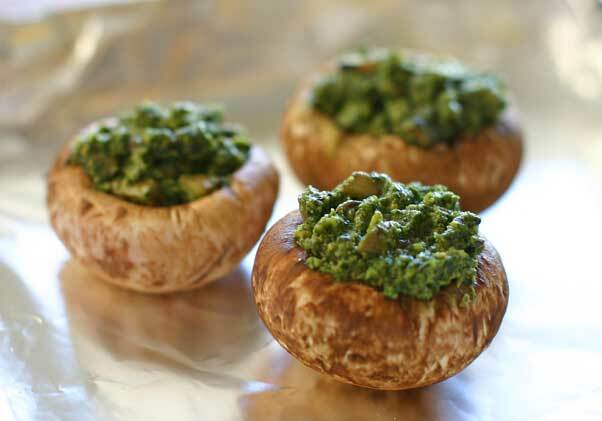 Add about a third of a cup (5-6 tablespoons) of pesto sauce and stir until the mushrooms and pesto are thoroughly combined. If you’re using frozen pesto, you can put it directly into the pan still frozen, just keep stirring until it’s thawed and incorporated with the mushrooms. Place the remaining four mushrooms on the baking sheet, hollow side up. 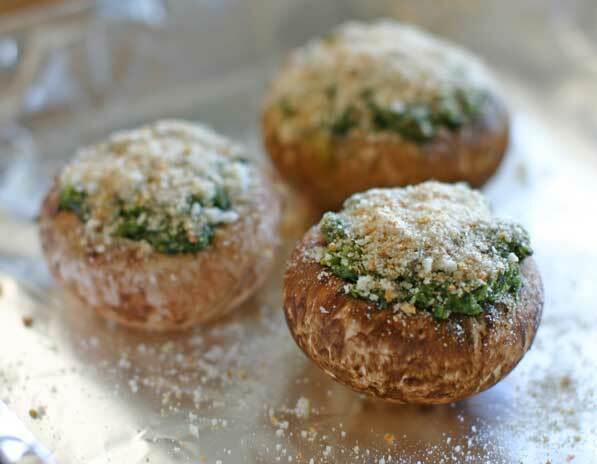 Fill each of the insides with the pesto-mushroom mixture. Stuff the mushrooms until they almost overflow. Don’t worry, they’ll settle and reduce a little as they roast. If you don’t have any ready-made breadcrumbs, you can make your own. Take a slice of stale baguette or other bread, chop it into small pieces with a knife and blend it in a blender until you’ve got relatively fine crumbs. I used the Magic Bullet to grind my stale baguette slice and it worked like a charm. 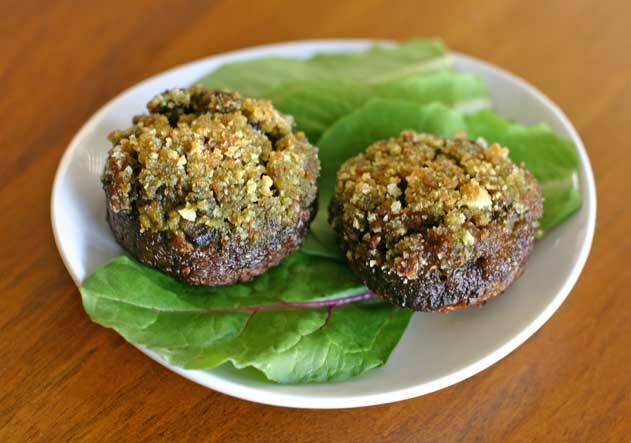 Sprinkle the breadcrumbs over top of the stuffed mushrooms, and use a finger to press the crumbs down very lightly into the pesto. 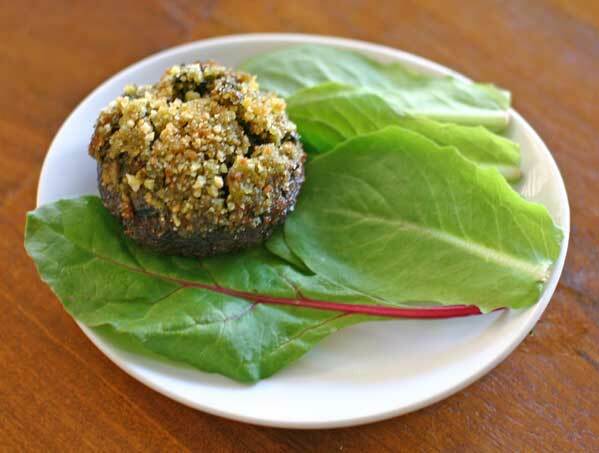 Bake the stuffed mushrooms in the oven for 20 to 30 minutes. Twenty minutes is sufficient, but the longer you can leave them in there, the more they will fall apart in your mouth when you eat them. Garnish a plate with some baby field greens and serve. You can bake these in advance and then warm them in the (toaster) oven for a few minutes before serving. 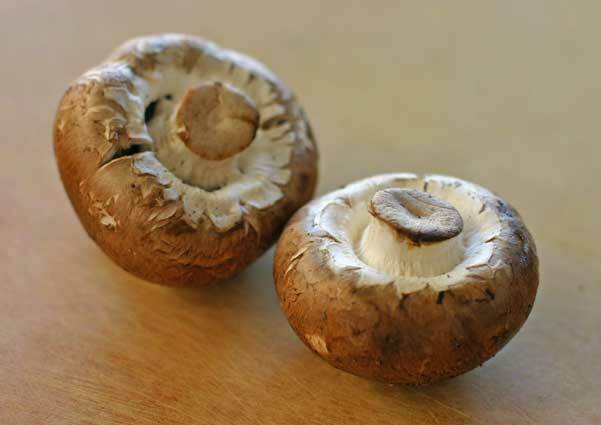 Portobello mushrooms are a good source of various micronutrients such as selenium, copper, phosphorus, potassium, iron, niacin and riboflavin. They also contain a significant amount of antioxidants. Their high ORAC (oxygen radical absorption capacity) rating means that they are better at fighting free-radicals than both carrots and green beans. A pleasant surprise, isn’t it?! See my earlier post for more nutritional details on the pesto. 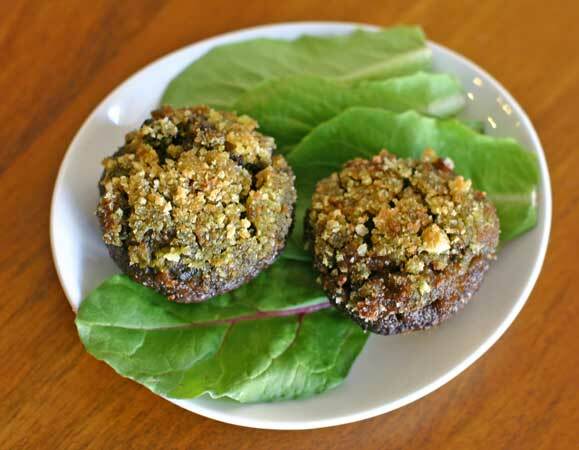 2 Responses to "Pesto-Stuffed Mushrooms"
Jeremy Jr. was looking at your blog tonight while I made dinner. “Oh! So *that’s* why those pesto-stuffed mushrooms came out so good the other day!” I loosely followed your recipe, using a garlicy basil pesto that I blended a handful of walnuts into. Thanks for the help! That sounds delicious! Thanks for the feedback, you guys just made my day 🙂 It makes me really happy to share the inspiration!